Whats behind the Euphoria in Asian Stock Markets and Gold? And what happens in Shanghai is of great interest to global commodity and stock market operators, because China is the locomotive of global economic growth, and its staggering factory output is matched by its demand for industrial commodities. China's share of global demand growth for commodities between 2002 and 2005 was: 51% for copper, 48% for aluminum, 87% for nickel, 54% for steel, 86% for tin, 113% for zinc, and 30% for crude oil. The PBoC began its pseudo tightening campaign to absorb billions of dollars of excess funds pouring into Shanghai's money markets from its ballooning trade surplus, foreign direct investment, and hot money flows into yuan denominated securities. But traders weren't fooled by the psuedo tightening. Bond yields stayed near historically low levels, and the stock market tripled, because the central bank focused mostly on soaking up excess liquidity rather than raising interest rates. What briefly spooked the markets on April 19th was the idea that this pattern might change. The last PBoC rate hike in March left the benchmark one-year deposit rate at 2.79 percent. That means real deposit rates, when compared to a 3.3% inflation rate are negative 61 basis points, which encourages a flood of hot money into China's frothy stock and real estate markets, which authorities say they want to prevent. Chinese Premier Wen Jiabao said on April 19th, that Beijing needed to take pre-emptive steps to prevent the economy from overheating in the face of excessive credit and money growth. "We need to prevent the economy from shifting from relatively fast growth to a state of overheating and to prevent big ups and downs. We will work hard to keep basic stability in the overall level of prices," he said. But Jiaboa has a major credibility problem. Over the past four years, the Chinese premier has vowed at least a dozen times to rein in the explosive growth of the M2 money supply, and to slow the economy towards 8-9% growth. But each year, Beijing fails to deliver. 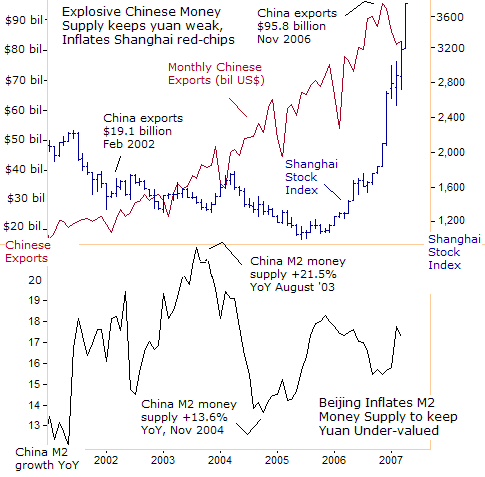 Instead, it inflates the M2 money supply at an average 18% clip, to keep the yuan undervalued and expand its economy at a 10% rate. The net result was a $232 billion trade surplus with the United States last year, and the loss of 3.2 million US manufacturing jobs, since the Bush administration took office. On the flip side, Chinese retail sales in Jan-Feb were 14.7% higher than a year ago, and industrial and bank profits are surging to record highs. Chinese exports soared to a record $252 billion in the first quarter, up 27.8%, while imports rose to $205.7 billion, up 18.2% from the same period a year earlier. China and India's enormous appetite for raw materials have lifted global freight costs for dry commodities to record highs, with congestion at Australian coal and mineral ports at a record 20-days. 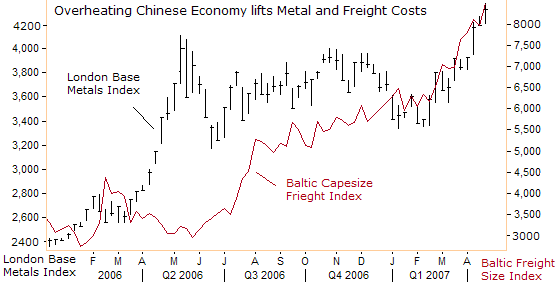 The Baltic Exchange's Cape-Size Freight Index, an indicator of global minerals demand, added 190 points to 8,795 on April 23rd, within easy reach of the December 2004 record of 8,911. India's industrial output was 11% higher in March from a year ago, accounting for 25% of its economic activity. In return for free and unfettered access to the US consumer market, China recycles much of its trade surplus into US Treasury, agency, and corporate bonds, helping to keeping US mortgage rate 100 basis points lower than otherwise. China's holdings of US Treasuries climbed to $416 billion. The Bush Administration has allowed the United States to become increasingly dependent on foreigners to finance the federal budget deficit, and future US national income will be depressed by interest payments to foreign holders of US debt. 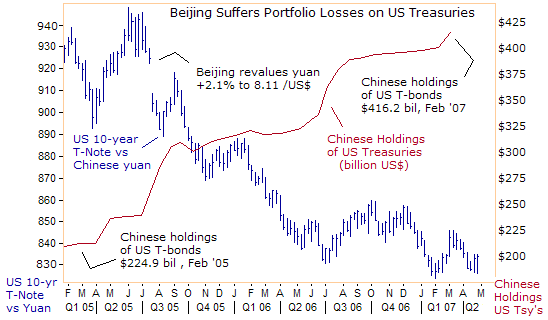 Beijing also owns more than $300 billion in US agency and corporate bonds, but suffers a loss on its massive portfolio, every time it allows the US dollar to trade lower against the yuan. Since Beijing unhinged the dollar /yuan peg in July 2005, the US Treasury 10-year Note has declined by 10.6% against the Chinese yuan. China's reserves have ballooned in recent years as the central bank, in order to hold down the yuan, has bought most of the dollars generated by a growing trade surplus, inflows of foreign direct investment and speculative capital. The central bank said on April 12th, that it FX reserves mushroomed by $135.7 billion to $1.2 trillion between January and March, more than half the $247.3 billion reserves accumulation for the whole of 2006. About 70% of China's FX reserves are held in US bonds. But while Beijing's has steered towards safe and stable investments, Chinese leaders might start to diversify the hoard into commodities or non-US dollar currencies. China might decide to dump some of its US dollar holdings, setting off a tidal wave of T-bond sales and imperiling the US economy. Instead, Beijing might buy oil fields, copper mines or even agricultural land to help sustain the country's development. 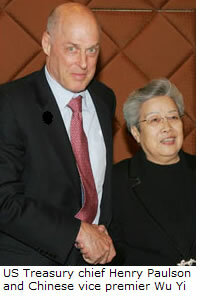 US Treasury chief Henry Paulson played down such concerns, noting that China's $416 billion of Treasuries are less than the value of an average day's trading. "US credit markets should be able to absorb without great difficulty any shift of foreign allocations," wrote Federal Reserve chief Ben Bernanke in a letter to Sen. Richard Shelby, on March 16th. "And even if such a shift were to put undesired upward pressure on US interest rates, the Federal Reserve has the capacity to operate in domestic money markets to maintain interest rates at a level consistent with our economic goals," Bernanke said. 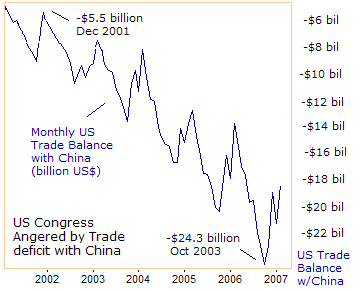 Thus, Bernanke indicates he's prepared to print US dollars to buy back the debt that is sold to China. The net result of such actions could be the collapse of the US dollar on foreign exchange markets, higher gold prices, and spiraling inflation in the United States. The trigger for Chinese sales of US bonds could be "veto proof" protectionist legislation by the US Congress, aimed at Chinese imports. Two leading US Senate critics of China's cheap yuan policy said on March 28th, they expected Congress to pass a "veto-proof" bill forcing Beijing to raise the value of the yuan against the dollar. "Well-crafted legislation, WTO-compliant and strong and effective is likely to pass with a veto-proof margin during this Congress," said Sen. Charles Schumer, a New York Democrat. "That's the message I hope the Chinese and the Bush administration take away from this hearing." The US Business & Industry Council, which represents small and mid-size US manufacturers, has attacked the Bush administration's empty rhetoric about the need for a stronger yuan, calling it "chit-chat diplomacy and a complete sham." But on April 22nd, Wu Xiaolian, deputy governor of the People's Bank of China, rejected calls for a quicker increase in the flexibility of the yuan's exchange rate. At current growth rates, China's economy would surpass the US in 25-years. But Chinese leaders worry that stiff US tariffs on Chinese imports could derail the world's fastest growing economy, and burst the Shanghai stock market bubble. When push comes to shove with "veto proof" trade legislation in the second half of this year, Beijing would probably relent and allow the yuan to climb higher at a faster rate. But until the political posturing turns into action, the Shanghai bubble could try to match the last great Asian stock market bubble – the Nikkei-225 of 1986-89. Chinese retail investors opened more than one million new trading accounts during the third week of April, bringing the total for the first four months of 2007 to more than 10 million. This figure is greater than that of the previous four years combined, even as signs of a bubble are getting clearer by the day. The Shanghai stock index has risen 50% so far this year, after tacking on a 130% gain in 2006. 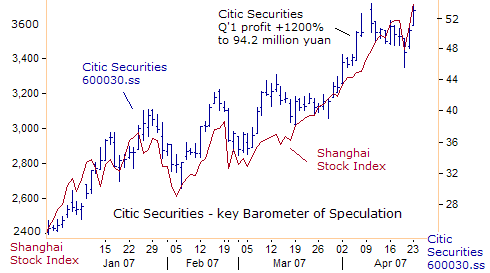 Chinese broker, Citic Securities, has tripled in value since early November, and is a good barometer of speculative sentiment in China. Citic Securities 600030.ss, Shanghai's first listed broker, said its net profit in the first quarter of 2007 rose more than 12 times from the same period a year earlier. Revenue for the three months ended March 31st, was close to that for all of 2006. 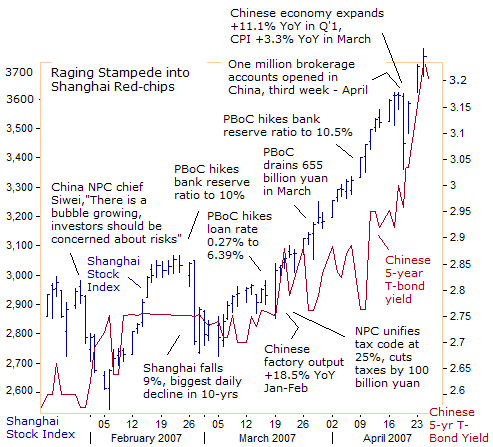 Speculative fever is running very high in China, and it's not wise to stand in the way of an Asian stampede. The Shanghai Securities News said the number of new brokerage accounts established in a single day hit a record 282,000 on April 19th, the day of the market's 7.2% plunge, bringing total accounts to over 90 million. This is a strong signal that market setbacks are not scaring Chinese traders away. And another PBoC interest rate hike might not scare speculators, because it would only adjust real interest rates from being sharply negative. Traders do not expect a sudden jump by the Chinese yuan, and believe authorities will hold appreciation for the rest of the year to around 3% to avoid hurting China's export sector. While China is the engine of global economic growth, Tokyo is the ultimate source of inflation in global commodity and stock markets. 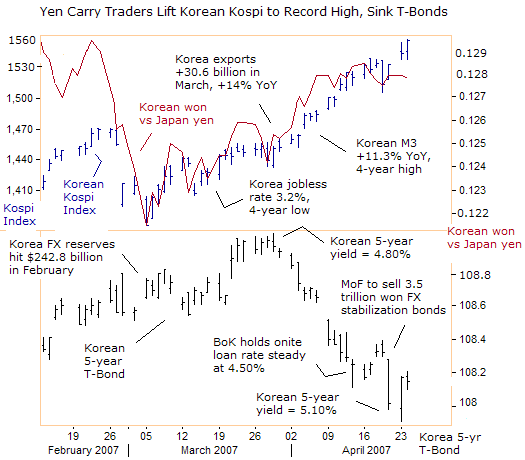 The infamous "yen carry" trade, which involves borrowing in low yielding Japanese yen at less than 1% to invest in risky commodity and stock markets, is on the Bank of Korea's (BoK) radar screen. On April 23rd, the BoK warned that "yen carry" traders are inflating its asset markets, and pushing the Korean won to uncomfortably high levels against the yen. But even as the Korean Kospi Index hit an all-time high of 1,554 points, the Bank of Korea understands that much of the impressive gains are linked to leveraged bets, financed with loans denominated in low yielding Japanese yen. Koreans borrowed $47.7 billion in foreign currencies last year, for a total $113.6 billion of outstanding debt, up 72% from a year earlier. Yen loans are also used to finance purchases of Korean real estate, and local home prices are up 11.6% from a year ago. While the BoK is not revealing the composition of the foreign currency borrowing, it's safe to assume that the Japanese yen is at the top of the list. So far this year, foreigners have bought a net 2.9 trillion won in stocks as of April 22, including purchases financed in Japanese yen. 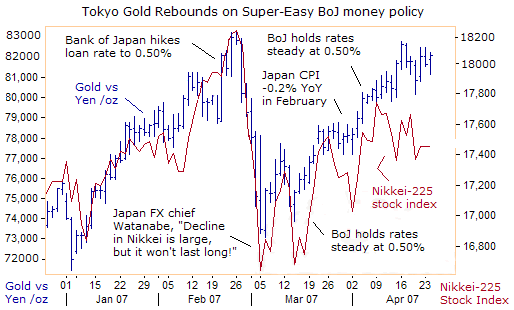 But on April 20th, Seoul indicated it would take aim against "yen carry" traders, thru direct FX intervention. South Korean T-bond prices extended their recent losses, lifting 5-year yields to as high as 5.10%, their highest in 11 weeks, when Seoul said it will sell 3.5 trillion of foreign currency stabilization bonds, using the proceeds for ammunition against "yen carry" traders. Seoul plans to dump the 3.5 trillion Korean won on the foreign exchange market, to slow the rise of the won against the yen and US dollar. Nearly 40% of Korea's economy is linked to exports, with China and the United States taking a combined two-fifths of the total. Electronics and autos account for about 45% of Korea's exports, and chip exports account for 10 percent. 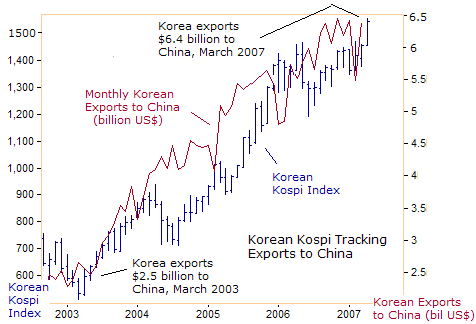 Because exports to the US have stagnated over the past three years, sales to China which reached $6.4 billion last month have become the key driver for the Kospi. Somehow, South Korea's total exports grew to a record $30.6 billion in March, up 14% from a year earlier, despite the won's unrelenting strength against the dollar and yen. 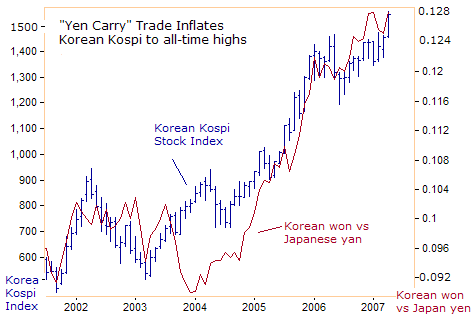 But South Korean exporters compete with their Japanese counterparts in key markets for similar products, so Seoul is worried that the "yen carry" trade could eventually put Kospi exporters at a big disadvantage. Still, it's going to be difficult to knock the Korean won lower against the yen, unless the Bank of Japan lifts its interest rates. 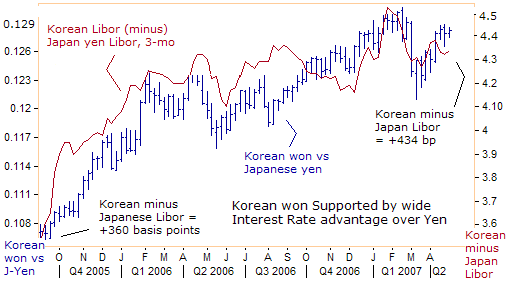 The won enjoys a hefty interest rate advantage of 433 basis points above similar deposits for the yen. Furthermore, the BoK is under pressure to lift its overnight loan rate to 4.75%, with Korea's M3 money supply exploding at an 11.3% annual rate, and home price inflation spiraling at 11.6%, in Asia's third largest economy. In order to discourage a further rally in the won against the yen, the BoK decided to keep its powder dry on April 12th, leaving its overnight loan rate unchanged at 4.50%. Thus, the Bank of Japan's super-easy money policy is exporting inflation to South Korea, by keeping the yen weak and preventing the BoK from hiking its loan rates. Without a further tightening in BoK policy to contain the money supply, Korean stock and real estate markets are expected to remain frothy in the near future. The "yen carry" trade has permeated into all corners of the globe, and is especially attracted to higher yielding currencies, like the Aussie dollar. It's been a wild rollercoaster ride, but Australia's Stock Exchange (ASX-200) Index has been catapulted to astronomical heights, in large part, due to the endless flow of cheap capital from Tokyo. 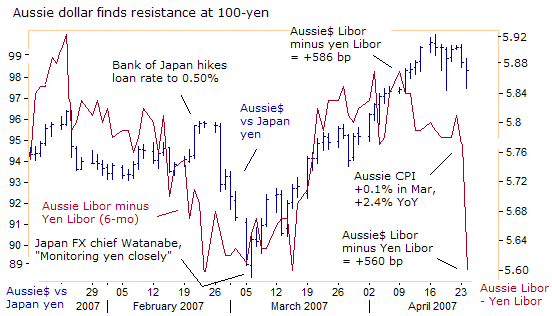 The Aussie dollar climbed 50% against the yen from its lows in 2001, but found resistance at the psychological 100-yen last week. The Aussie dollar also reached 84 US-cents, its highest in 17-years, helped by speculation the Reserve Bank of Australia (RBA) would raise its lending rate by a quarter-point from a six-year high of 6.25 percent. Last month, the RBA passed up a chance to lift its loan rate to 6.50%, despite explosive growth of the Australian M3 money supply, which is accelerating at a 14.3% clip, its fastest in 17-years. Much like the Bank of Korea, the RBA is reluctant to raise interest rates further, to prevent the Aussie dollar from climbing above 100-yen. Japan is Australia's largest trading partner, and Australian Treasurer Peter Costello is trying to talk down the Aussie dollar to help local exporters. Earlier today, the Australian government provided the central bank with at least three months of breathing space, by conjuring-up a surprisingly low +0.1% inflation rate in the first quarter. That translates into a 2.4% annual inflation from +3.3% in Q'4, and is now within the RBA's 1% to 3% target range for the first time in 12-months, taking pressure off the central bank for an immediate rate hike. The government's fuzzy math showed a 34% plunge in fruit prices offseting a 13.3% spike in pharmaceutical costs, a 7.1% increase in school tuition fees, and higher home rents which climbed 1.4 percent. The drop in fruit prices was led by a whopping 73% plunge in banana prices. But while government apparatchniks were lowering the consumer inflation statistics, the central bank admitted in February that the Aussie M3 money supply is out of control, expanding at an explosive 14.3% annualized rate, it's fastest in 17-years. That had led to expectations of an RBA rate hike to 6.50% in April or May to rein-in M3. But the Aussie dollar's strength against the yen, handcuffed the RBA. The RBA had been gradually lifting its overnight loan rate for the past five years, from as low as 4.00% in Q'1, 2002 to as high as 6.25% in November 2006. 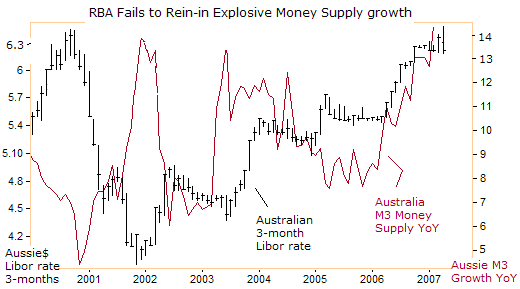 But the RBA's slow-motion baby-step rate hikes didn't contain the run-away M3 money supply. Neither did the RBA slow down bank loan demand, which is 13.2% higher from a year ago. 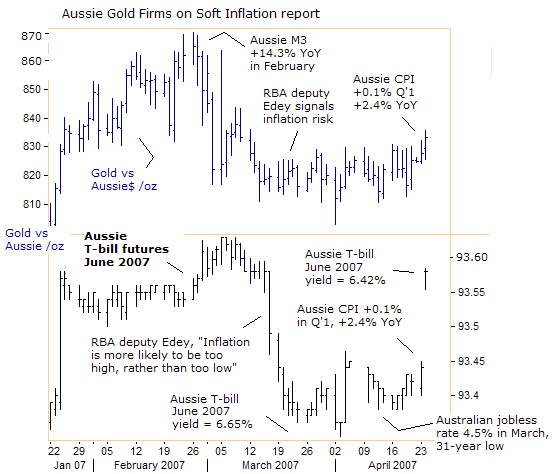 Without a further tightening in RBA monetary policy, inflation pressures in the Aussie gold market could continue to simmer at the boiling point. Last year, the RBA intervened on a regular basis in the foreign exchange market, by selling A$3.6 billion, anxious to hold the Aussie dollar below the psychological 80 US-cents level. 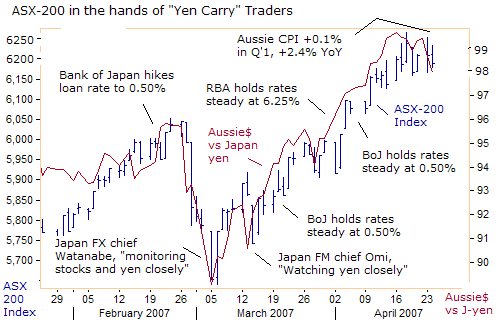 But "yen carry" traders and the Federal Reserve's shift from a tightening bias to a neutral bias on March 21st, overwhelmed the RBA's intervention efforts. The stronger Aussie dollar against the deficit ridden US dollar and the ultra-low yielding Japanese yen, persuaded the RBA to keep its powder dry at 6.25% on April 3rd. 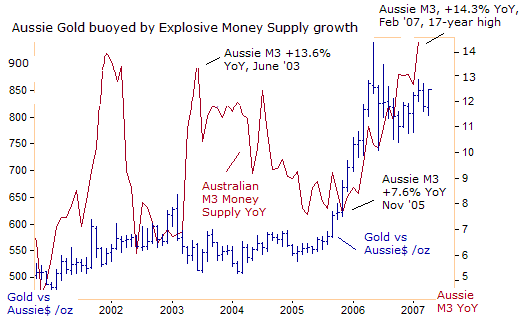 But Sydney gold traders aren't swayed by the government's fuzzy math on inflation, and instead, are watching the growth of the M3 money supply. Gold ended 0.8% higher in Sydney to A$634 /oz, following the surprisingly low inflation data, tracking a 14-basis point surge in Australian T-bill futures, which lowered the implied yield for June to 6.42%. The inflation report was a shocker for Sydney T-bill futures traders, leaving a huge gap on the daily charts, while scaling back expectations of an RBA rate hike to the fourth quarter. Treasury chief Costello said Australian inflation hit a peak in the middle of last year and appears to have decelerated. "The headline inflation rate will go lower. You will see a headline rate next quarter below 2 per cent," he declared. Ironically, with the RBA handcuffed on rate hikes by the Treasury chief, Sydney gold traders have a green light to bid the yellow metal higher in the weeks ahead. Ordinarily, sharply lower interest rates would be construed as bullish for blue-chip stocks. But the ASX-200 ended 20-points lower after the benign CPI report, because "yen carry" traders unwound long positions in Aussie stocks, while the Aussie dollar came under selling pressure vs the yen. The ASX-200 Index is in the hands of "yen carry" traders, and the psychological 100-yen level for the Aussie$, proved to be a barrier for the ASX-200 Index at the 6,250-level, an all-time high. With so much riding on the Aussie /yen exchange rate, it's interesting to note, that the interest rate differential between the six-month Aussie Libor and the Japanese yen Libor shrank to +560 basis points from +588 basis points after the release of the CPI data. Still, the Aussie dollar retains a wide interest rate advantage over the yen, and carry traders could look to buy the commodity currency again at the next support level. The next Bank of Japan rate hike to 0.75% is not expected until June. In Tokyo, the big story is not about the Nikkei-225 index, but rather the gold market. With the Japanese yen hovering at a 21-year low against a basket of foreign currencies of its top trading partners, it's not surprising that Tokyo gold prices are bubbling at a 26-year high. On March 26th, Bank of Japan chief Toshihiko Fukui warned, "there could be side effects if interest rates are kept low for too long. But for now, the BOJ will maintain easy monetary conditions ensuing from very low interest rates while monitoring economic and price conditions," Fukui added. Four days later, Tokyo financial warlords handcuffed the BoJ from raising interest rates in Q'2, with a report that consumer prices were -0.2% lower in February from a year earlier, suggesting that the world's second largest economy had slipped back into deflation. But Tokyo gold traders were not duped by the doctored inflation data, and bid the yellow metal 5% higher to 82,000-yen /oz. The BoJ's Atsushi Mizuno, the lone hawk at the central bank warned, "A policy of yen weakness and may increase protectionism among Japan's trading partners, and cause distortions in global asset prices by speeding up capital outflows from Japan," he said. Most likely, the "yen carry" trade and the Shanghai bubble will greatly influence trends in global currency, commodity, and stock markets this year. The possible unwinding of the "yen carry" trade makes the Asian and European stock markets skittish. But what's behind the unrelenting strength of the Dow Jones Industrials? Which global markets are most impacted by the Shanghai bubble? What's the outlook for the "Commodity Super Cycle?" These questions and much more were answered in the April editions of Global Money Trends, published each Friday mornings, for a total of 44 issues per year! Insightful analysis and predictions for the (1) top dozen stock markets around the world, Exchange Traded Funds, and US home-builder indexes (2) Commodities such as crude oil, copper, gold, silver, the DJ Commodity Index, and gold mining and oil company indexes (3) Foreign currencies such as, the Australian dollar, British pound, Euro, Japanese yen, and Canadian dollar (4) Libor interest rates, global bond markets and central bank monetary policies, (5) Central banker "Jawboning" and Intervention techniques that move markets.